Yesterday I found myself back onboard Cruise & Maritime Voyages, Marco Polo, and the sun was shining for her arrival in Port of Tyne. I spent 3-nights aboard this wonderful little ship in October of last year and I was excited to be meeting with her once again, even if it was for just a few short hours. Once the formalities had been completed I made my way along the dock and stepped aboard, (joking as I went that I could board via an ACTUAL gangway this time. I almost missed the ship in Belgium last year, you can read more on that here) heading straight for the Waldorf restaurant where we would enjoy a 4-course lunch. Considering I am a very picky eater (or a pain in the backside as my friend would probably say) I managed to select something for each course that I would happily eat. 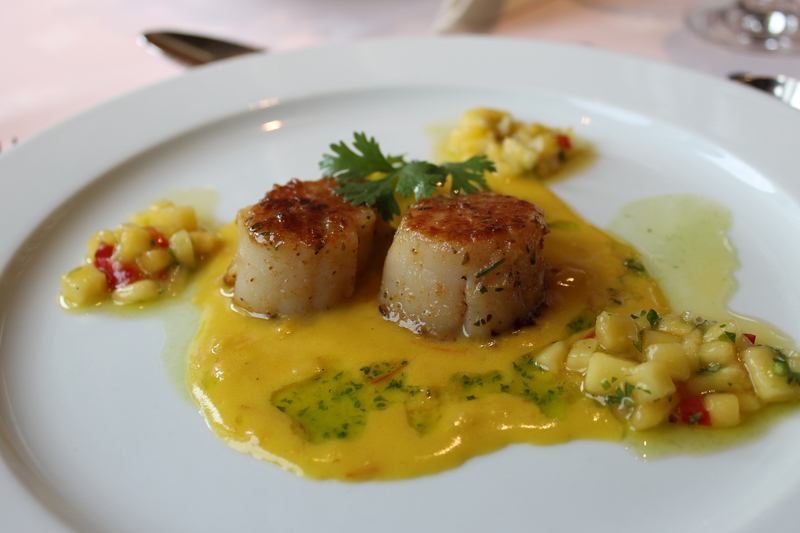 To start I went with the Cajun crusted scallops served with Saffron Beurre Blanc and mango salsa and I have to say they were absolutely delicious, so much flavour – I could have eaten more! Next I had the wild mushroom soup, which again was very nice indeed, In fact let me say that it was one of the nicest mushroom soups I have had. For main course I decided to go with the Beef Tenderloin stuffed with mushroom and cheese and served with baby potatoes, grilled vegetables and red wine sauce. Desert was a real treat, chocolate lava cake and vanilla ice cream. The perfect end to a rather tasty lunch. After the tour the majority of people left the ship but I decided to stay and enjoy an hour to myself on the open decks. 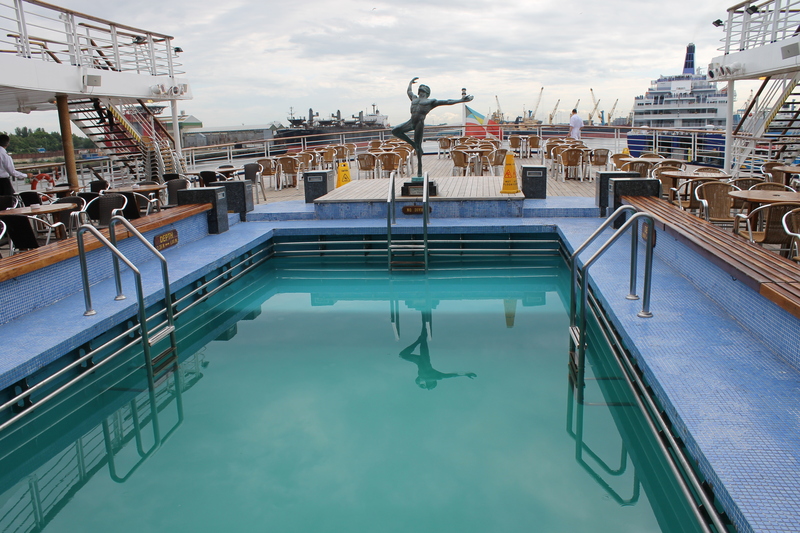 The biggest thing for me on any ship are the open decks, there has to be good exterior space where one can sit and do nothing but watch the world go by and Marco Polo certainly offers that. By now there were a fair few passengers onboard and the area was getting quite busy. It was nice to feel everyone’s excitement and I had a short chat to one gentleman and his wife who were on the trip specifically to visit the Orkney Islands. 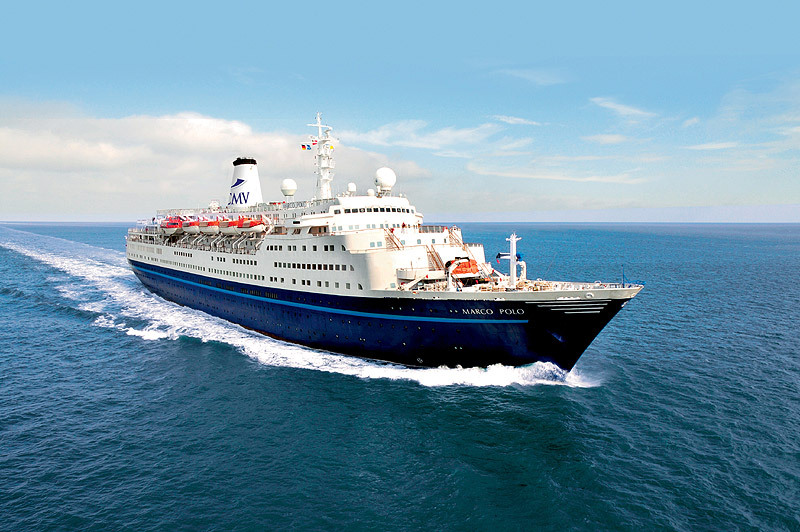 They said they had tried many cruise lines, from high end luxury, family friendly and a bit of everything in between, but they very much liked the Marco Polo and were happy to once again be onboard. I don’t remember what time it was when I disembarked but I do remember looking back along the dock and wishing I was going with her. I just wanted to stay onboard and enjoy what I am sure was a beautiful sailaway at dusk.